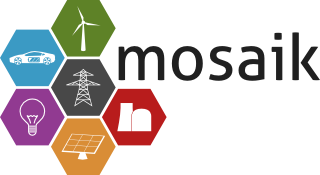 Mosaik is a flexible Smart Grid co-simulation framework. Mosaik allows you to reuse and combine existing simulation models and simulators to create large-scale Smart Grid scenarios – and by large-scale we mean thousands of simulated entities distributed over multiple simulator processes. These scenarios can then serve as test bed for various types of control strategies (e.g., multi-agent systems (MAS) or centralized control). Mosaik is written in Python and completely open source (LGPL), including some simple simulators, a binding to PYPOWER and a demonstration scenario. The mosaik API allows you to easily integrate existing simulators, control strategies or other components into mosaik, no matter in which programming language they are implemented. Mosaik provides a simple API to create large-scale simulation scenarios. You can start simulator processes, instantiate models and connect the resulting entities (e.g., one-by-one or based on probability distributions). Mosaik can start new processes for a simulator or alternatively connect to a running instance of it. If a simulator is written in Python 3, it can also be imported and executed in-process. Mosaik uses an event-discrete simulation based on SimPy to coordinate the execution of all simulators. Thus, each simulator can have a different step size which may even vary during the simulation. Handling complex scenarios is one of the biggest challenges in Smart Grids research – mosaik solves that. Flexibly integrating COTS energy system simulators is a great feature of mosaik. We need to integrate our MATLAB load and DG models with power system simulation for a large number of scenarios – mosaik makes our life a lot easier. Mosaik is easy and fun to use. Coherent scenario specification and flexibility toward the co-simulation composition are the strongest features of this tool. This technological gem, including the integration framework mosaik, is a ground-breaking real-time co-simulation platform. © 2012–2019 OFFIS. All Rights Reserved. Impressum/Legals / Datenschutz / Privacy.